Don't you just hate it when someone blocks the driveway of your house and the need to take out or bring in your car is just as burdensome as taking out that vehicle parked in front? When will the rule for no parking, no purchasing of new vehicle be legal? 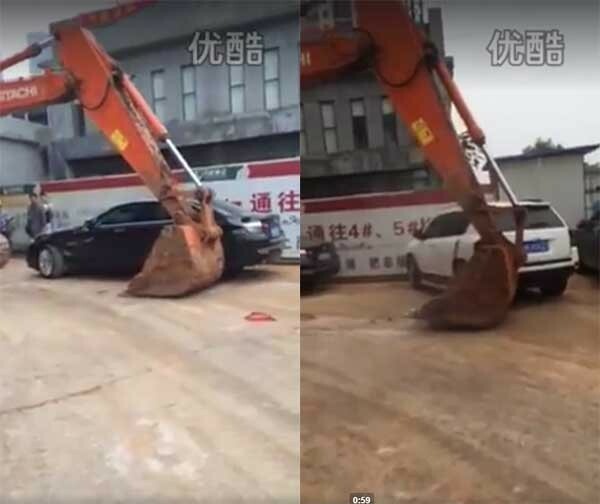 On the video, the need of the excavator to move out is blocked by these two (2) vehicles parked near the construction site. Since the owners or drivers of the vehicles are nowhere to be found, the excavator just pushed out the vehicles away like pancakes. Can we call in an excavator to do this to illegally parked vehicles blocking our driveway too?